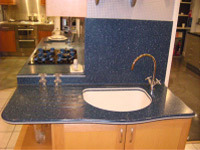 Corian, manufactured by Du Pont, is composed from acrylic resin and a mineral filler. The result is a solid, nonporous, hygienic and durable smooth surface that offers a wide range of applications including Corian kitchen worktops. It is joined by specialist fabricators using an adhesive to produce a visibly seamless look. This is particularly useful in large islands as it makes it appear as one large piece of Corian. It also allows you to blend two complementary colours, add different colour inlays and even have your sink made from the same material but in a contrasting colour. Its main weakness is that it is not totally heat resistant. However, this is easily overcome by the clever use of inset pan support bars. If you are worried about putting hot pans straight into a Corian sink, then simply specify a stainless steel base to the bottom of the sink. 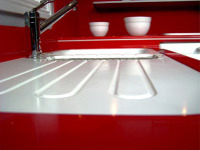 Corian has an extensive range of colours, detailed edge profiles and sink mounting options. 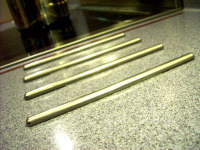 You can also add upstands from 10mm high through to full height splashbacks behind sinks and hobs. It is still being used extensively worldwide across many environments, which is testament to its appeal, performance and design benefits.